DENVER (AP) Von Miller says he's optimistic he'll soon have a long-term contract with the Denver Broncos. Earlier this week, general manager John Elway said there's only been one offer and one counter-offer with Miller's representatives. Elway placed the exclusive franchise tag on the star linebacker. 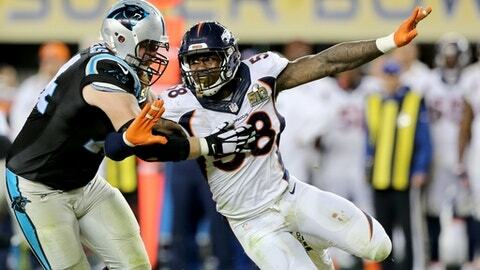 Miller won MVP honors at the Super Bowl after his two sack-strips of Cam Newton led to Denver's only touchdowns in its 24-10 win over Carolina. Miller is skipping voluntary team workouts while awaiting a new contract. Meanwhile, he's competing on ''Dancing With the Stars,'' which he said will improve his sack dances this season.